One of the great things about people you don’t see very often is that they give you ideas; they travel outside your everyday circles. My beloved sister-in-law, Missy (of the Cherimoya/Dinosaur egg fame), had a few ideas that got me going, but it was her love for ginger ice cream that really piqued my interest. Ginger ice cream isn’t a new idea. It’s relatively common in Chinese restaurants or in Asian communities in large cities in the US. 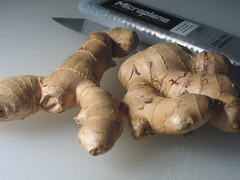 What I tried to do was enhance the ginger flavor in the ice cream to give it the depth and bite that I love about fresh ginger. How did I achieve this? 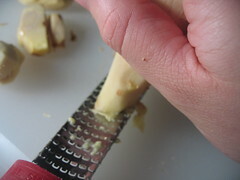 By adding both fresh and candied ginger into the ice cream. 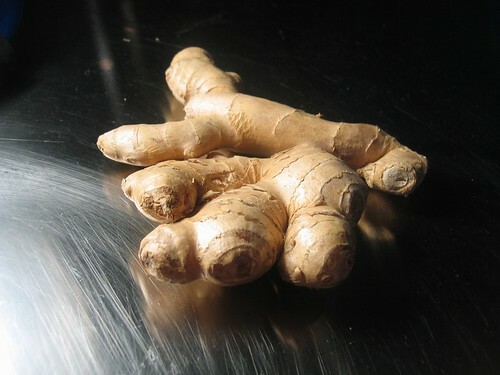 Candied ginger has a fiery or spicy flavor, and fresh ginger has more subtle flavor variations. Combine the two and the result is a very robust kick to go with the ice cream’s sweetness. I think the big winning element, however, was suggested by my wife. 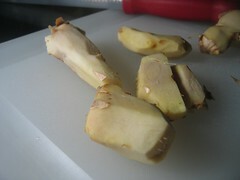 When tasting the unadorned ginger ice cream, she commented that it would be great with a caramel sauce. 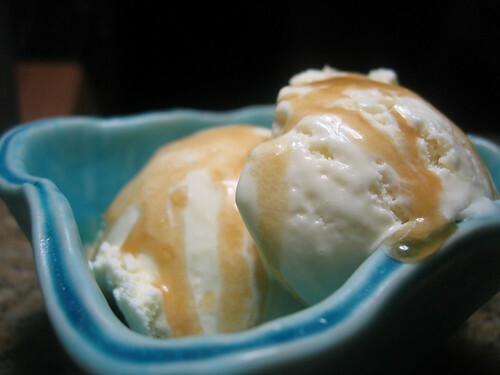 Even better, I thought about reintroducing the coconut milk flavor I had used in the ice cream in this caramel sauce as well. I replaced the heavy cream in a traditional caramel sauce with the coconut milk leftover from my ice cream making. I think the results enhanced everything. 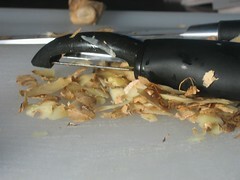 The whole effect is a taste of coconut, a lot of ginger, and that cold, smooth ice cream texture. The sauce is great; it goes into the fridge to be reused when we break out the ice cream. It warms up well in the microwave after a few seconds. Overall, you have to love family. Forget their value to your well-being, health, and stability in life. They are great muses. Also, they are great guinea pigs for the sometimes wacky and bizarre tests of the kitchen. 2. Over a double boiler, add the heavy cream, coconut milk, milk, all the fresh ginger, and candied ginger. 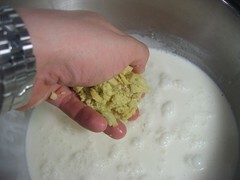 Whisk frequently to ensure most of the candied ginger begins to dissolve and to ensure that the fresh pieces do not burn on the bottom. 3. 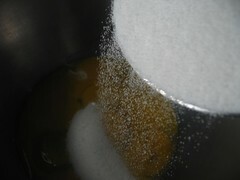 In a large bowl, beat together the egg yolks and sugar. 4. 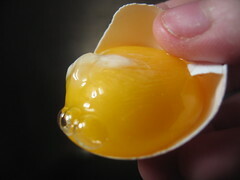 Once the liquid mixture has reached about 130F degrees, begin to temper the egg mixture. 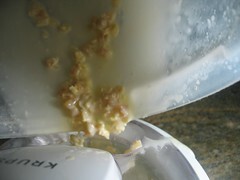 Do this by adding a ladle full of the hot liquid to the eggs while whisking. This will prevent the eggs from cooking. You are slowly bringing them up to the temperature of the hotter liquid; this ensures you don’t have scrabbled eggs in your ginger ice cream. 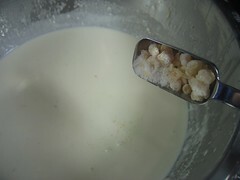 Continue to add a ladle full at a time of the hot cream until you’ve added about half the cream to the egg-sugar mix. 5. 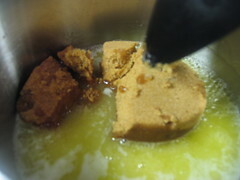 Add the tempered egg-sugar mixture back to the cream over the double boiler and continue to whisk regularly. 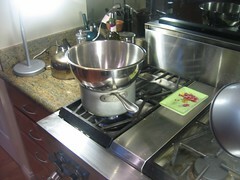 Once the temperature of the mixture reaches 160F, remove from heat and let cool. 6. Cover and refrigerate, preferably overnight, but at least until cool. 7. Place in the ice cream maker and churn according to instructions. In mine, it takes about 20 minutes until it looks like soft serve. 8. Place in a container, cover the surface of the ice cream with plastic wrap to prevent a skin from developing, add the additional lid, and freeze for about an hour or until it has finished setting up. 9. Serve with coconut caramel sauce — and maybe even a tad bit of fresh toasted coconut to garnish — and enjoy! 1. In a saucepan over medium high heat, melt the butter. 2. 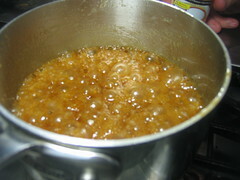 Once the butter is bubbling and has a nutty aroma, add the brown sugar, corn syrup and salt and turn down to medium heat. Cook until you have roiling bubbles that are slow to fade away. This should be about 6 min. Be careful. This is napalm hot. 3. 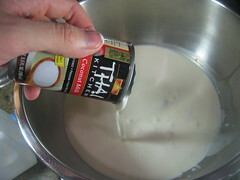 Remove from heat and mix in the coconut milk and vanilla. Stir thoroughly to combine. 4. Pour into a new container (preferably microwave safe) to let cool. I use a plastic squeeze bottle, which allows me to drizzle it onto the ice cream. 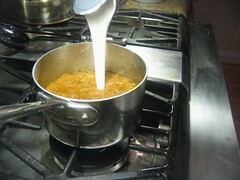 If the sauce thickens too much, place in the microwave for 10-second increments until its loose or even hot. Drizzle over one of a million things, including ginger ice cream, and enjoy!